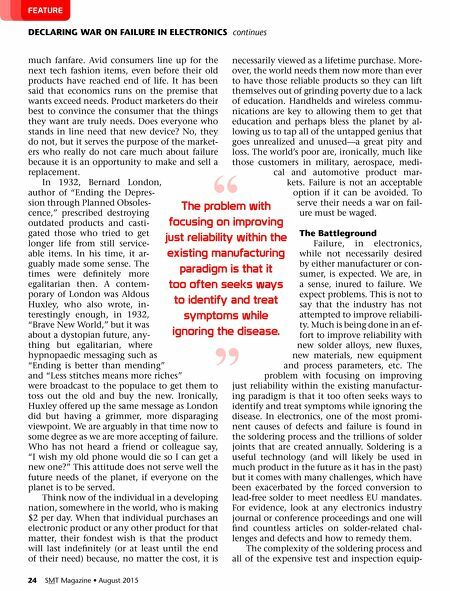 August 2015 • SMT Magazine 25 DECLARING WAR ON FAILuRE IN ELECTRONICS continues ment add cost, but no true value. They are much like medical tests used to detect disease in humans; they may alert one to the prob- lem but they do nothing to treat it. Detection should not be confused with treatment, but too often it is. We applaud ourselves more for find- ing defects than for eliminating them. Clearly, soldering is an imperfect process and one that is unlikely to ever achieve perfection. Moreover, it is cause for collateral damage to both compo- nents and PCB substrates because of the high temperatures required and the deleterious ef- fects associated with those high temperatures. Even after the product is built, solder remains the weak link. Failed solder joints are a leading cause product failure in use. Given the situation, how might one de- feat such a formidable foe? Eliminate it. Solder is useful but not necessary for electronic as- sembly. Most electronic products can be built without solder today by simply reversing the manufacturing process. That is, rather than soldering components to circuit boards, cre- ate component boards and build up circuits on them. The manufacturing infrastructure exists; it simply needs to be repurposed. Most legacy components can be adapted, but some are bet- ter than others. However, the purpose of this brief piece is not to provide all of the details; the subject has been written about in numer- ous papers with references provided at the end. Rather, the purpose is to appeal to the reader's reason by asking for their consideration of a few questions. 1. How much does it cost to procure equipment for and operate the soldering process? 2. How much does it cost to procure and use inspection equipment to support the soldering process? 3. How much does it cost to procure and use solder rework and repair equipment? 4. How much does it cost to service warranties against failure? 5. Could the monies spent in support of the solder process be better spent in making the product more robust while using many fewer manufacturing, cleaning, inspection, and test steps? There is an adage that goes like this: "First do the right thing, then do things right." The EMS industry appears to have declared a one- sided truce with solder by continuing to use it, but solder continues to fight with the EMS in- dustry. It is a Sisyphean effort to try to conquer such a foe; moreover, the definition of insan- ity left to us by Albert Einstein is, "to do the same thing over and over and expect different results." Sadly, our species is prone to forming habits. It is easiest to do what we did yesterday. Unfortunately, the future demands adaptation and change from its survivors. In the words of Bob Dylan, "If you ain't busy growing, you're busy dying." On the bright side, we have a choice. In summary, the electronics industry is in a continuing struggle with solder, whether or not it fully recognizes it or remains in denial. Fail- ure is the enemy and solder is, unfortunately, the root cause. There exists a potential to save many billions of dollars while making products that are, at once, more reliable and more envi- ronmentally benign by simply eliminating sol- der from the process. It is just a matter of will to enter into a war on failure. SMT References 1. Occam Process—Stanford University 2. Method for the Manufacture of an Alumi- num Substrate PCB and its Advantages, Fjelstad, J., Circuit Insight. 3. 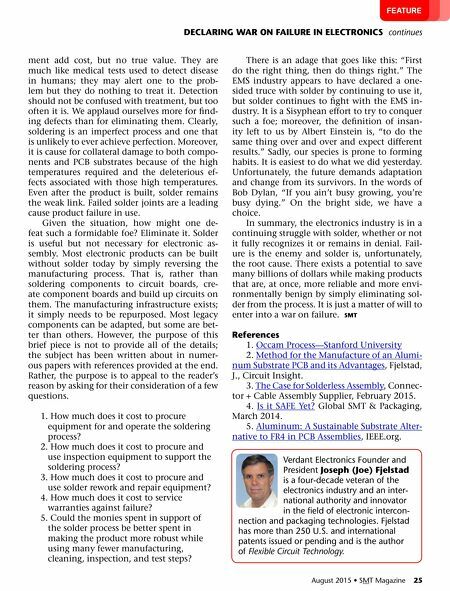 The Case for Solderless Assembly, Connec- tor + Cable Assembly Supplier, February 2015. 4. Is it SAFE Yet? Global SMT & Packaging, March 2014. 5. Aluminum: A Sustainable Substrate Alter- native to FR4 in PCB Assemblies, IEEE.org. FeAture verdant electronics founder and president Joseph (Joe) Fjelstad is a four-decade veteran of the electronics industry and an inter- national authority and innovator in the field of electronic intercon- nection and packaging technologies. fjelstad has more than 250 u.S. and international patents issued or pending and is the author of Flexible Circuit Technology. Feature — How Clean is Clean Enough to Achieve Reliable Electronic Hardware?